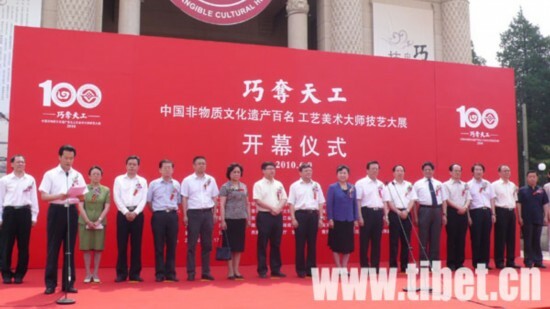 The opening ceremony of Intangible Culture Heritage Exhibition. Prior to the 5th Intangible Culture Heritage Day on June 12, a themed intangible culture heritage exhibition was unveiled in Beijing Exhibition Hall on June 9 offering masters of Tibetan Thangka and Regong art to reveal their unique skills and marvelous masterpieces. Covering an area of 3,600 sq.m, the exhibition was divided into 9 categories such as List of Intangible Culture Heritages, Embroidery, Jade Carving, etc. Visitors can enjoy 318 masterpieces of 100 artists from 23 provinces, regions and cities. In 2006, Tibetan Thangka and Regong art were listed onto the first batch intangible culture heritages at the national level. And in 2009, Regong art was put on the list of World Intangible Culture Heritage by UNESCO. As typical examples of Tibetan intangible culture heritages, Tibetan Thangka and Regong art were showcased to reveal their unique charm to visitors in order to the inherit and develop the traditional Tibetan culture.